As with all appliances, different models and brands of kettle are all made differently and therefore have different rates of energy consumption. 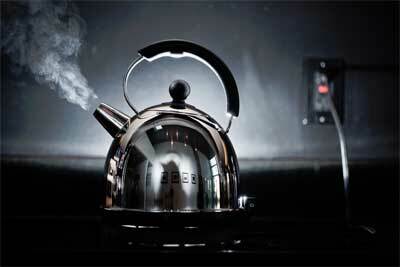 The average kettle is between 2 and 3 kilowatts (kw). The electricity that you use in your home is measures in kilowatt hours (kWh) which is the number of kilowatts used per hour. Most people will be charged per unit of electricity so you might be charged 12p per kwh used. So if you had something that uses 1kw, it would need to be on for a full hour in order to use up 1kwh. The cost of this would be 12p. If you had a kettle that uses 2kw then in one hour it would use up 2kwh. The cost of this would be 24p as you have used 2 units. This might not sound like a lot, and of course we won’t usually have our kettle on for a full hour but it all adds up. Obviously it is difficult to work out exactly how much people can save but lets just say that your electricity costs 12p per unit and you have a 2kw kettle. People on average boil their kettle 4 times a day. If you fill a kettle full (8 cups) it will take around 10 minutes to boil and if you calculate this for the full year, it will cost you £58.40 per year just to run your kettle. If you were to just fill the kettle for 2 cups each time you boiled it, it would only take around 2 minutes to boil, if you calculate this for the full year it will cost you £11.68. This is of course only an estimate as to how much you could potentially save but there is a significant difference and if you think about the fact that this is just one appliance out of everything in your house, you can see how this could build up and make a difference to your bills. There are a number of other household appliances that use more electricity than you might think so it is always good to try to limit the amount we use them. Not leaving appliances on stand-by is a good way to save a little money. It is important to remember not to take this to the extreme though; there will be times when you do need to fill your kettle or when appliances do need to be used (that is what they are there for) but it’s always good to try to cut out the waste to save a little extra cash.